A synthesis is a specially written discussion that refers to one or more sources. In order to write a great synthesis essay, you need to be able to infer relationships among analyzed sources. There could be a bunch of various sources to deal with including articles, fiction works, essays, interviews, lectures, etc. This is quite a natural process to distinguish relationships since every person deals with such tasks when trying to find relations between events and their reflection in papers, shows, etc. In fact, writing a research paper means writing a synthesis as well. A synthesis is a way to understand the relationships among various analyzed sources and come up with proper findings and predictions. When you need to write a synthesis, you can use all your analytical skills and an ability to come up with proper findings. Working with two sources, you need to distinguish what the analyzed sources are about and what they say. Therefore, you need to summarize the chosen sources. This is a very effective decision, especially when you want to represent your sources to the audience. The summary of the sources is both useful for further research work and for readers who only start dealing with the information you reveal. Moreover, when analyzing two separate sources, you need to evaluate their validity and quality, thus you need to come up with conclusions. In addition, you need to decide for yourself whether you agree or disagree with the main points revealed in the sources. Once you have conducted a proper analysis of the sources, you need to come up with the analysis of the relationships between the sources. You need to compare and contrast various sources and consider their relationships. Moreover, you can deal with a variety of different sources, if needed. Thus, there is no need to analyze only 2 sources, when your work requires to provide a wide study. Since this work can include the profound analysis of the relationships among a set of sources (A, B, C, D, etc. ), you need to pay enough time to complete 5-paragraph essay. The synthesis is a complex work based on analysis of two or more sources. Therefore, you need to select the sources carefully to come up with proper findings. There is no need to describe every possible point outlined in the sources. This means that you need to select the exact ideas and information to work with from every source. Moreover, the selected information must help the writer to achieve his purpose. First, when dealing with a synthesis essay, you need to read all the chosen sources carefully. Moreover, numerous academic assignments provide a set of special requirements for every type of essay paper. Therefore, you can be asked to evaluate content, argue a topic’s position, describe and explain cause and effect relationships, etc. The sources you use in your paper will be differently used in other types of essay papers, including contrast and compare, persuasive, and argumentative essay papers. Therefore, make sure you know what to do with your chosen sources in advance. 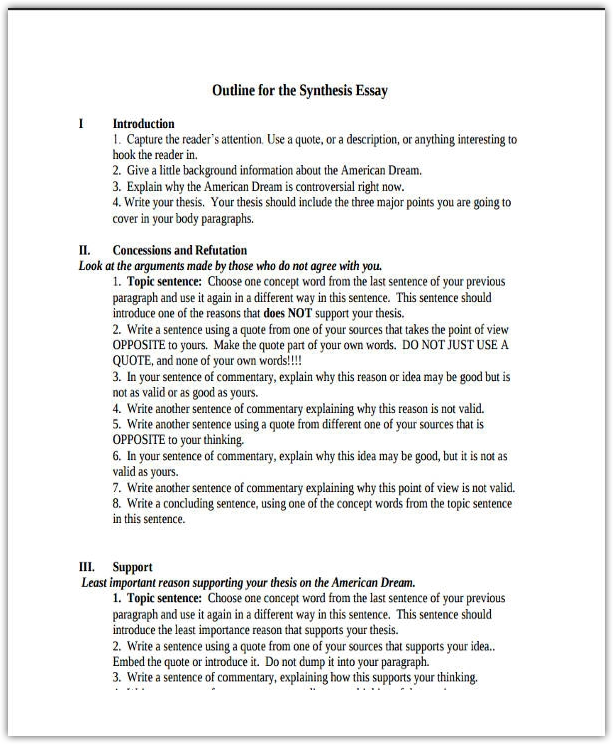 The use of the sources depends on the purpose of a synthesis essay paper. Therefore, you need to choose the sources having a certain aim. Moreover, the nature of a synthesis essay paper brings a need to analyze and combine various ideas. In such a case, you need to be well aware of what the sources reveal. The basis of every source is important. You need to synthesize the sources to discover their relationships and to determine the relations between sources and their purpose. You need to check in advance what the exact material to choose and how to use the parts of the materials in your writing piece. 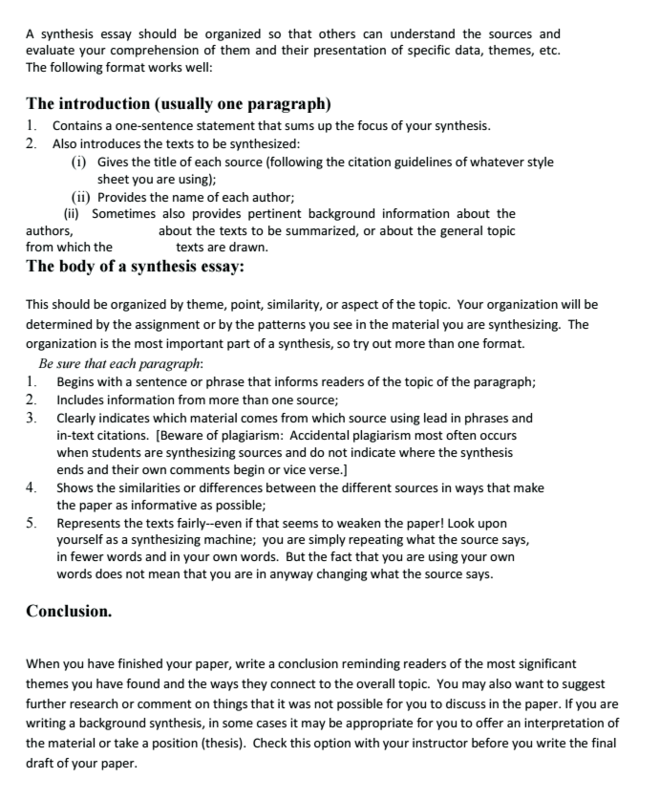 There are two types of synthesis, which can be used by students who prepare an essay paper. This type of synthesis helps readers to understand a topic. The writer needs to divide the text into clear and understandable parts to let the reader understand the entire text and its content easier. The explanation can be full of descriptions, thus it will be easier for a reader to imagine a certain place, object or event more clearly in this own mind. The explanatory synthesis essay remains a complex assignment, which requires more details and explanations to present a set of facts to outline a certain point of view. Moreover, this type of text requires a careful reading of an entire source to come up with proper conclusions. The argumentative essays always include a part, which remains explanatory in its nature. The argumentative synthesis is aimed at presenting your own point of view. Moreover, you need to support your opinion with numerous facts and other evidence. Always use relevant and up-to-date facts when preparing a synthesis essay. This type of essay remains a unique reading of source materials, thus other writers may disagree with you. There could be a lot of writers who support the opposite point of view. Still, you need to provide strong and relevant evidence to support your own opinion, write an essay for me and let the audience share your point of view. Use your sources to support your claims and ideas, thus do not focus on other activities. You need to provide original ideas when you work with 4.0, 3.5 and 3.0 papers. The 2.5 paper does not require unique ideas or new opinions. The 4.0, 3.5 and 3.0 papers require a dialogue between the author and the source material. The 2.5 requires mostly a single summary of ideas. Most of the papers include all the sources into the debate, thus it is good to provide numerous comments and arguments and check the relationships between the ideas revealed. Create your special appropriate manner to address the audience. Therefore, make sure to provide credibility of the sources and sufficient information to make your arguments really relevant and solid. Provide a clear thesis statement and make sure it reflects the essay’s main focus. Deal with the solid point only and state every argument clearly. You also need to connect your points with the thesis statement. Provide needed transitions between paragraphs. Develop every idea using various methods and concepts. Make sure to deal with relevant materials and select proper up-to-date evidence to support your point of view. Your writing 1000-word paper must contain parts of the analyzed materials in order to support your points of view. Use proper transitions and phrases to integrate the sources into your writing piece. Avoid unnecessary repetition. Chose words carefully. Use a dictionary to select the most appropriate words. Use only clear sentences. There is no need to use a passive voice in the paper. Try to double-check every sentence. Make sure you use the same writing style in the entire writing piece. Proofread the complete paper to make sure the paper remains unique and flawless. Proofread the paper to identify the proper writing and check for any mistakes. Check the paper to assure there are no grammar, punctuation or lexical mistakes. 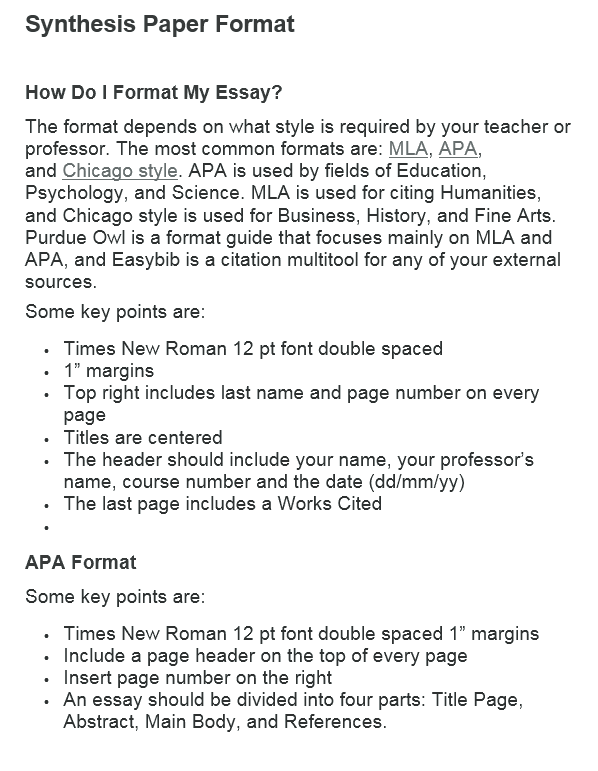 When you need to prepare a synthesis essay, tutors mostly assign MLA format. Thus, check the MLA documentation to cite the sources properly. Use the tutorials to provide a correct Works Cites section. Provide an attention-grabbing title to gather the reader’s attention. Make sure your synthesis essay has proper formatting and all the sources are cited correctly. When you write a synthesis paper, you need to deal with every stage of paper performing correctly. Come up with your writing purpose. Therefore, read the topic assignments a few times to consider the proper purpose. The purpose determines the set of needed analyses and research work, and it brings the needed working plan to follow. Choose and read your sources a few times. Focus on your main purpose when reading the sources. Identify the parts of the text you want to use in your synthesis essay paper. Re-read the sources and underline the main ideas, thoughts, and details you need to use in your synthesis essay. Design a thesis. The thesis is the main element of every synthesis essay since it reveals the main idea you want to present in your article critique example. 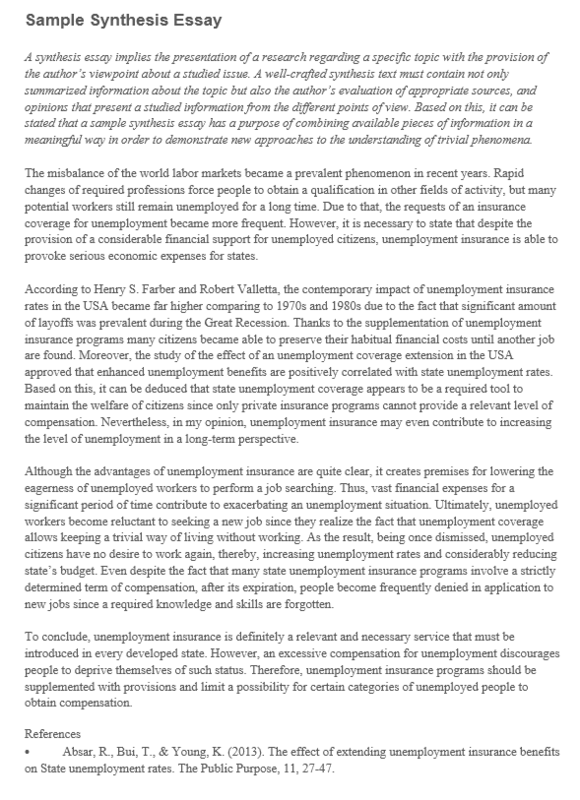 The thesis is a complete sentence with the main topic’s statement. Writers prefer including a thesis into the final sentence of the paper. This format remains the most common among modern writers. You need to decide how to use the sources. Make short notes to write down your ideas and important information. Always focus on your main purpose. It will help you to achieve your main goals easily. Create your organizational plan aimed at performing a writing piece according to your thesis. You need to arrange the material properly. It is important to prepare an outline, which will be used as a writing plan to keep up with your writing goals. You need to present materials in the way to indicate the relationships among the analyzed sources and provide numerous explanations and descriptions. Write the draft of your synthesis essay. Make sure to follow your organizational plan. You need to work according to your plan to prepare an excellent essay paper. You can also generate your own unique ideas in order to provide new opinions. Since the main ideas provided need to be original, you must re-read your arguments carefully to assure a logical order of the sentences and uniqueness of the ideas revealed. File your sources. You need to use MLA format to document your sources. Moreover, you must deal with the proper format of citations listed in your Works Cited section. You need to write down the title of the material and summarize its content. It is important to write down the author’s name, the cited materials, and its brief description. Revise your synthesis. You need to provide proper transitions and phrases to combine various arguments into a single essay paper. You also need to integrate your quotations logically, thus use only relevant quotes. Revise your essay a few times to assure its logical order and smooth structure. You also need to check the paper for lexical, grammatical and punctuation correctness. When you prepare a synthesis essay, there are certain elements you need to focus on in order to prepare an excellent final paper. Summary. The easiest way to deal with your synthesis essay is to summarize the information presented in your analyzed sources. With such a purpose, you need to check every of the examined sources and come up with their brief summary. It should be short explanations and descriptions of the sources. In the same time, with summarized information used, you cannot get any unique ideas. Therefore, you need to look for relevant and specific evidence in the sources. 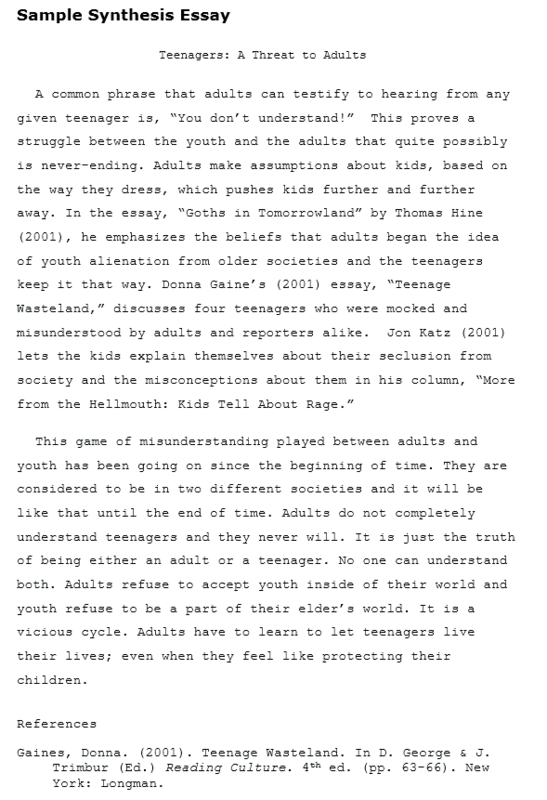 The summary is an important work, but the synthesis essay needs additional techniques to be followed in order to complete a useful essay paper. After dealing with summarized sources, you need to distinguish the main sections and paragraphs of the sources. You also need to be well aware of your audience’s desires to come up with proper summarized parts of the paper. Example of Illustration. You can use a definite illustrating example or various illustrations from other sources to make needed points in your paper. Definitely, you can paraphrase the examples provided or summarize them properly before including them the main text. You can also quote the information directly from the source. Definitely, you must always provide proper credits in your final work. Two or More Main Reasons. The writers often use “two reasons” approach in order to write down their arguments and thesis. This method calls for writing down the thesis and offering two or more reasons that support the thesis stated. You can use as many reasons as you need to persuade your audience and support your thesis statement with strong and relevant evidence. Make sure to put the main reasons into the last part of the section, since readers often remember the last thing they read. Strawman Technique. Strawman technique allows presenting an argument against your key thesis. Moreover, you need to show that the argument presented is weak and pointless. Therefore, this technique allows demonstrating your awareness of every side of the argument and brings you more possibilities to prepare an answer. This technique requires first the presentation of the thesis, the further argument introduction, the description of certain weaknesses of the argument, and, finally, the presentation of a positive argument. Concession. The concession technique also shows the opposite argument first, but it does not require to reveal its weaknesses. In fact, it shows that the opposite argument is strong, but the positive one is even a stronger one. You need to use strong arguments with solid evidence and describe every point you disclose with all details. This advanced method is often used when you deal with the audience that supports the opposite argument in general. Comparison and Contrast. Comparison and contrast technique allows you to examine two sources by checking their differences. Furthermore, by contrasting and comparing, you can provide a multifaceted analysis bringing solid findings to the audience. In order to conduct a proper comparison analysis, the writer needs to read sources carefully and to analyze and discover certain criteria. The criterion is an important point to which the authors may agree or disagree. A good criterion allows you to distinguish important similarities and differences.